The one bedroom villas are something special, their interior designer made absolutely sure of that. You’ll love the layout that’s perfectly styled to suit small families or couples who love the privacy and space that a separate bedroom area allows. Includes a queen bed (separate bedroom) and two single bunks (all linen supplied). Full size bathroom, fully equipped kitchen. Colour television, Foxtel, air conditioning and ceiling fans. Private verandah with patio setting. Newly refurbished … bright, funky, functional with a bedding configuration that makes them ideal for two couples travelling together or a family plus grandparents. Full size bathroom, fully equipped kitchen, two colour televisions, Foxtel, air conditioning and ceiling fans. Private verandah with patio setting. It all starts with their stunning sites, each swathed in a lush mini rainforest of palms, fragrant shrubs and rock gardens forming your own private, tranquil retreat. And while their amenities are fabulously appointed (think top hotel), you’ll find the huge kitchen and their many barbecue areas make great spots to socialise, meet new friends and compare travel tales. For caravans, motorhomes or campers, they can offer sites with, or without, a concrete slab. A number of easy drive through sites are also available on request. A great family holiday has two must-haves: separate bedrooms and loads of living area. The two bedroom cabins have all this and more – more creature comforts, more room and more stylish, contemporary décor. But despite all this, you’ll find yourself spending a lot of time on your balcony, enjoying the spectacular gardens and soaking up the wonderful holiday atmosphere. It’s a great alternative to the typical Airlie Beach apartments. It’s no doubt the reason that these cabins are the most popular choice for family accommodation in Airlie Beach. Full size bathroom with spa and separate toilet. Fully equipped kitchen with dishwasher. Tastefully furnished plus two flat screen televisions, Foxtel, sound system/dvd player. Air conditioning/ceiling fans. Large private verandah with designer patio setting. Their Ensuite Sites are large and spacious featuring toilet, shower, vanity and are fully tiled throughout in a stunning combination of white, terracotta and jade. Every site has a concrete slab and is individually landscaped with rock gardens featuring rainforest trees, palms and flowering tropical plants. Think of everything you love about Whitsunday holiday apartments then dream even bigger. For starters, the spacious three bedroom condos have that unmistakable ‘interior designer’ touch radiating stylish yet relaxed tropical pizzazz. Then the huge outdoor living area adds the spread-out factor, perfect for two families holidaying together or for extended family holidays where grandparents can enjoy priceless bonding time and have their own space. Finally, gorgeous lush gardens ingeniously offer privacy and a serene outlook. It’s so much better for families than regular Whitsunday apartments. Bath ensuite to main bedroom with double shower. Bath with spa and separate toilet. Fully equipped kitchen with dishwasher. Laundry with washer/dryer. Tastefully furnished plus two flat screen televisions, Foxtel, sound system/dvd player. Air conditioning/ ceiling fans. 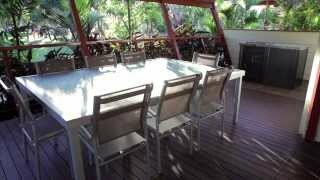 Large private verandah with barbecue and designer patio setting. The Deluxe studio cabins are modelled on the hotel-style layout like many apartments in Airlie Beach – but that’s where the similarity ends. Each studio cabin has its own lush, secluded garden and unlike any hotel room you’ll find, the cabins are totally self-contained, giving you all the options for whipping up a meal. Super-clean, bright and breezy and with tasteful contemporary décor, also are perfect for short stays, a budget Whitsunday holiday or for those travelling to Airlie Beach on business. Queen bed, two single bunks and trundle (all linen supplied). Privacy curtain divides the open plan design of the cabin. Tiled ensuite with shower, toilet and vanity. Fully equipped kitchenette. Colour television, Foxtel, air conditioning and ceiling fans. Private verandah with patio setting. Located opposite their resort pool with stunning verandah views. Think of everything you love about Whitsunday holiday apartments then dream even bigger. For starters, the spacious three bedroom condos have that unmistakable ‘interior designer’ touch radiating stylish yet relaxed tropical pizzazz. Then the huge outdoor living area adds the spread-out factor, perfect for two families holidaying together or for extended family holidays where grandparents can enjoy priceless bonding time and have their own space. Finally, gorgeous lush gardens ingeniously offer privacy and a serene outlook. 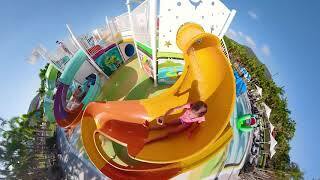 It’s so much better for families than regular Whitsunday apartments! Bath ensuite to main bedroom with double shower. Bath with spa and separate toilet. Fully equipped kitchen with dishwasher. Laundry with washer/dryer. Luxury furnishings plus two flat screen televisions, Foxtel, dvd player, iphone/ipod dock. Air conditioning/ceiling fans. Large private verandah with barbecue and designer patio setting. Brand new, opened September 2018....Their Premium two bedroom cottages are the ultimate modern two bedroom cabin and simply stunning! With a relaxing location overlooking Paluma Range and in close proximity to their waterslide park, resort pool, playground and jumping pillow, you’ll find yourself sitting back on the huge balcony truly relaxed while you watch the kids run free! With two-bedrooms, one-bathroom, separate toilet and an enormous living area, their cottages are ideal for a large family or a group of eight travelling together with their clever bedding configuration . The two bedrooms both have a king bed and a set of bunk beds. Full kitchen with an oven and dishwasher, washing machine and dryer. Please note: a minimum night stay applies depending upon the season.